North Lanarkshire Council has put into action an innovative approach to meet the Scottish Government’s pledge to double free childcare from 600 hours per year to 1,140 by August 2020. The Government’s move to double childcare is estimated to be around £4,500 in childcare costs for a working family with a three or four-year-old child. North Lanarkshire Council’s proactive approach to planning for the increase in child care hours available, along with its support offered through the Supplier Development Programme to potential child care providers, means the local authority is on track to deliver the full amount of hours by 2020. In its 2018 audit report on early learning, Audit Scotland stated that across Scotland, the Scottish Government estimated that between about 6,000 and 8,000 whole-time equivalent additional staff will be needed to deliver the expansion by 2020. As part of a phased 1,140 hours expansion implementation strategy, North Lanarkshire Council Education and Families Committee approved the procurement of an interim Framework for 2-5 year olds which will last for one year. The Framework will be open to all private sector providers including Childminders and Private Nurseries who can provide 1,140 hours capacity within North Lanarkshire. The approximate cost for delivery in 2019/20 by private sector providers is £11.802 million. North Lanarkshire Council approached the Supplier Development Programme (SDP) to provide bespoke training on how to bid for this public sector work through Scotland’s public sector procurement website, Public Contracts Scotland. 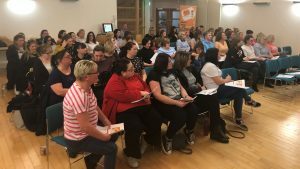 SDP Scotland arranged for two courses to be delivered, free of charge, to childcare providers and private early learning providers, in the evenings of Wednesday, 20 and Thursday, 21 March 2019. More than 140 providers of child care registered to attend the two training sessions.